Satoshi Kamatsuka, Chairman of the General Affairs Committee, says "We're very satisfied with the crisp picture, which stays truly vivid even when the room is bright enough to take notes." According to Mr. Kamatsuka, who played a leading role in the process of updating the projection system, "We recently held a 130th anniversary event, and the large-screen projections were a big hit." We asked him about how Panasonic projectors were introduced, and what his impressions were. In April 2007, the University of Tokyo ("Todai") celebrated the 130th anniversary of its establishment at its current location. Overall, the university has over 300 years of history as the pinnacle of learning in Japan. Now, the large-scale image projection system in the iconic Yasuda Auditorium has been fully renewed. Panasonic projectors support Todai, as it continues to symbolize to the world the power of Japanese scholarship. A large-scale image projection system has been in use at Yasuda Auditorium for 15 years. Just before the recent update, the projector used was a Panasonic TH-D9610J. "We were using it for about five years, but recently we had been getting comments from professors such as "it's a little dark," "I wish it were a bit sharper," and so on. While considering options for improvement, he met with anasonic for a consultation. However, says Mr. Kamatsuka, "the managing director in charge suggested that we consider all equipment options," and other companies besides Panasonic were also consulted. Rear projection, LCD TV screen stacks, and other options were considered. In the end, however, a demonstration of the Panasonic equipment in Yasuda Auditorium, at which the managing director in charge was present, led to the adoption of the Panasonic projector. Mr. Kamatsuka also appreciates the cost performance, saying, "projectors are surprisingly reasonable, and two PT-D10000 projectors could be purchased with our initial budget." 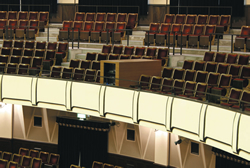 A PT-D10000 dual stack is installed in the front row of the balcony. Yasuda Auditorium is large enough to accommodate 1100 people, and is hardly ever used for standard student-oriented lectures, but rather for public lectures, conferences, symposia, and so on. 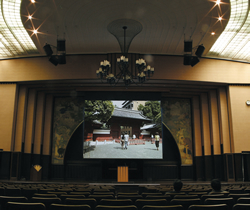 Nowadays computers and other equipment are essential tools for presentations, and Yasuda Auditorium has been making use of a large 300-inch screen. 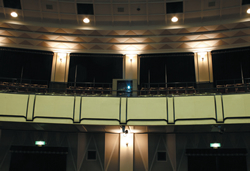 However, mercury lamps are used to light the auditorium, and when these are switched on the interior becomes very bright, so in the past they had to be kept off when the projector was in use. "We had received complaints because it was impossible to take notes in such darkness." The recent equipment update solved this problem. "Not only can notes be taken while bright images are being projected, but they're also very quiet," says Mr. Kamatsuka. Those who attended the 130th anniversary ceremony in November 2007 appreciate this quality. They won't soon forget the large, vivid images projected above the heads of the three Nobel-Prize-receiving alumni who addressed the audience at this event. "We've also had a positive response from the professors who use this equipment," Mr. Kamatsuka says. "They don't hesitate to complain if there's an equipment malfunction, but we’ve heard absolutely nothing about this equipment," he's happy to say. The PT-D10000 projector gives large, crisp images without placing any burden on the historic, 80-year-old Yasuda Auditorium, and continues to play a proud role in the mission of conveying to the world the finest of Japanese academia. The images on the 300-inch big screen stay crisp even with the mercury lamps fully switched on. The projector cabinet is custom-made to suit the atmosphere of Yasuda Auditorium. With a low-noise design, the equipment doesn't disturb lectures, even when mounted right among the seats. *Japanese model name of PT-D10000 is TH-D10000.